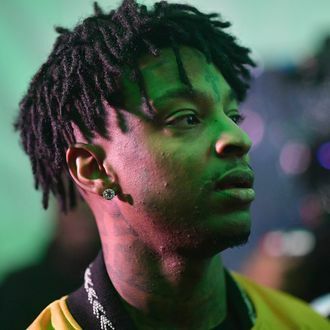 21 Savage has issued his first public statement since being detained by ICE for allegedly living in the U.S. illegally. In a new statement released via his lawyer, the rapper confirmed that he was born in the U.K. in 1992, but says ICE’s claims about his immigration history are inaccurate. In their initial arrest, ICE alleged that Savage (né She’yaa bin Abraham-Joseph) came to the U.S. from Britain in 2005 when he was 12 on a one-year visa that was never renewed. Savage now states that he immigrated to the U.S. when he was 7 years old on an H-4 visa, which would’ve been around 1999. He says he then visited the U.K. for a month in 2005 and returned with a still-valid visa. By 2006, he says he lost his legal status “through no fault of his own,” and applied for a new visa in 2017 when he discovered he’d been in the U.S. illegally. Savage’s lawyer, Charles H. Kluck, maintains that Homeland Security has known about his immigration status since that new application. Kluck claimed in a statement on Monday that ICE is now attempting to “intimidate” Savage into leaving the U.S. and has denied him release on bond. In the new statement, Kluck says that Savage is eligible to seek cancellation of removal from an immigration judge because he has lived in the U.S. since the first grade and has immediate family who are either permanent residents or citizens, including his mother and four siblings. Kluck also told TMZ that ICE may have targeted Savage after he criticized border control during a performance on the Tonight Show last week; he added the lyric “been through some things so I can’t imagine my kids stuck at the border” to his song “A Lot.” On Tuesday, Savage’s co-manager shared that Savage is currently being held under 23-hour lockdown.